This area covers the Isle of Skye, the closely linked mainland area of Lochalsh and the island of Raasay. For accommodation in the area see the links in the "See and Stay" menu above. See the map below for an outline of the area and links to surrounding areas. Armadale, on Skye's southern Sleat Peninsula is the terminus for the ferry from Mallaig. Beyond Armadale, a minor road takes you through Ardvasar as far as the beautiful crofting township of Aird of Sleat, two miles short of the Point of Sleat itself. Just east of Armadale is the Clan Donald Skye Visitor Centre. Here you find Armadale Castle Gardens and the ruin of Armadale Castle, together with the superb Museum of the Isles. North west of Armadale, a single track road winds its way to the scattered settlement of Tarskavaig. Further along the coast is Tokavaig, itself overlooked by the ruins of Dunscaith Castle and, with the neighbouring village of Ord, offering some of the best views to be had of the entire Cuillin range. A few miles further, and back on the main road, is the picturesque village of Isleornsay, once Skye's main fishing port and is now one of its most attractive villages. Not far away are the picturesque remains of Knock Castle. 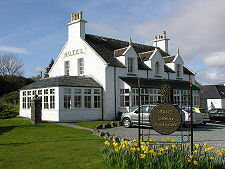 There are three excellent hotels in or near Isleornsay: Hotel Eilean Iarmain is in the village itself, while Duisdale House Hotel is less than a mile to the north and Toravaig House is a couple of miles to the south west. In recent times the road from Armadale to Broadford, which was once single track all the way, has been upgraded to a high standard for its whole length: which has brought Sleat very much closer to the rest of Skye. Kyleakin, at Skye's eastern tip, was the main ferry port before the coming of the Skye Bridge in 1995. It is home to the Bright Water Visitor Centre, offering summer visits to Eilean Bàn, the island which was once home to the author and naturalist Gavin Maxwell and which now provides a stepping stone for the Skye Bridge. Four miles down the coast from Kyleakin is Kylerhea, from where a ferry service operates to Glenelg on the mainland during summer months only. Here you'll also find seal trips operating to view the colony on Eilean Mhal. The most significant settlement in south Skye is Broadford, the island's second largest village. Its mile long main street curves around a wide bay and boat trips leave from its pier. Broadford used to be home to the unusual Skye Serpentarium, but this has now closed. 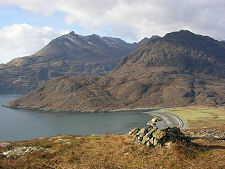 A side road from Broadford takes you by a scenic route to Elgol, passing en route the fascinating ruin of Cill Chriosd. 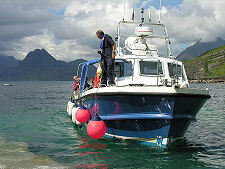 From Elgol, the excellent Bella Jane Boat Trips take you into the heart of the Cuillin. The A87 heads out from Broadford, hugging the coastline as it twists and turns en-route north towards Portree, offering up views out to the Isle of Scalpay. The island is part red-deer farm and part forestry plantation and boasts the peak of Mullach na Carn rising to 1,298ft. From the head of Loch Ainort travellers can choose to take the steep short cut across the pass to Loch Sligachan or the minor road which meanders round the coast. Both reach Sconser, departure point for ferries to the island of Raasay and home to a nine-hole golf course with spectacular views. A little further you come to Sligachan and its hotel, pretty much in the centre of Skye. The majestic Cuillin mountains dominate the southern half of Skye. Surrounded by cascading water and expanses of rough terrain the area offers some of the most challenging climbing in Scotland. Access is by one of three routes: from the south on foot or by boat from Elgol, from the Sligachan Hotel at their northern end, or from Glen Brittle on their west side. View a 3200x600 pixel panorama of the Black Cuillin from the east here. There are few easy routes in the Cuillins, and 11 Munros form the main ridge, with another, Bla Bheinn, as an outlier. These are mountains to take seriously, and most are for experienced mountaineers only. From Sconser a road heads west to the village of Carbost, home to the Talisker Distillery and, in our view, one of the finest single malt whiskies. A minor road leading from a junction just south of Carbost takes you to Glen Brittle and some superb views of the central Cuillin ridge. 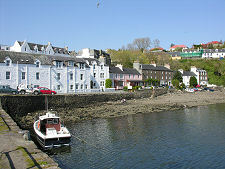 Portree is a busy tourist resort and the main town on Skye. It is built around a natural harbour and the town's brightly painted houses rise steeply from the water's edge. The harbour is overlooked by the Lump, a peninsula of land that was once the site of public hangings on the island. The pier, built by Thomas Telford in the early 1800s, still provides a safe haven for the fishing and other vessels using the harbour. Up above the harbour is the town centre and Somerled Square, built in the late 18th Century as the island's administrative and commercial centre. Today you'll find the bus station and car park here. Nearby is the Royal Hotel, on the site of McNab's Inn, the place where Bonnie Prince Charlie is said to have taken leave of Flora MacDonald. Portree is home to a number of churches, including the Parish Church on Somerled Square. 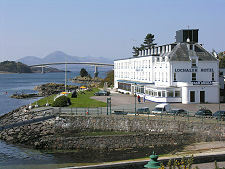 Overlooking Portree harbour is the excellent Cuillin Hills Hotel. Extending some twenty miles north from Portree is the Trotternish peninsula, where the bizarre landscape is the result of volcanic activity overlying soft sandstone bedrock. The coast is marked by sheer cliffs and there are pinnacles and pillars strewn along its length. Other features on the peninsula include, just six miles north of Portree, a distinctive column of rock named The Old Man of Storr. At 165ft it presents something of a challenge for those who choose to climb it, whilst a walk to its base is a more straightforward undertaking. A good, if occasionally muddy, path runs up through woodland from the car park below. 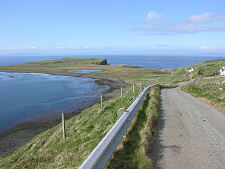 Staffin has a museum with fossil finds from the area and a dinosaur bone discovered in 1994. In 1996 several dinosaur footprints were also discovered here. The village itself has a thriving Gaelic speaking community. From Staffin a single-track road cuts across the peninsula allowing access to the Quirang, a spectacular forest of pinnacles and fierce rock formations. Some have been named: the Needle rises a full 120ft, and there is a Prison and a Table, the latter being a great sunken platform of rock where the locals are once said to have played Shinty. At the tip of the Trotternish peninsula lies Duntulm and the remains of the headland fortress of Duntulm Castle. Heading down the west shore from here is the excellent Skye Museum of Highland Life, the best visitor attraction in northern Skye. Half a mile east of the museum is Kilmuir Graveyard, home to some fascinating graves, including that of Flora MacDonald. South of here is Kilmuir in an area once called the Granary of Skye because it was so heavily cultivated: today it is home to the intriguing Kilvaxter Souterrain. Four miles further is the ferry port of Uig. From here ferries make the journey to Tarbert on Harris and Lochmaddy on North Uist. The journey from Uig to Dunvegan takes you past one of Western Scotland's very few Pictish stones, Clach Ard, and close to the attractive little village of Edinbane, now bypassed by the main road. North western Skye's main settlement is Dunvegan. 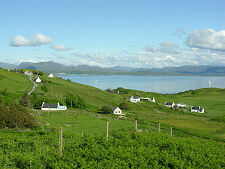 The village itself spreads attractively along the shore of the sea loch and makes a good base for exploring the area. It is home to the Angus MacAskill Museum. 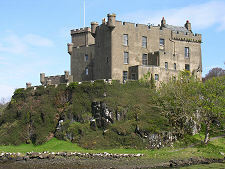 A mile north of Dunvegan is Dunvegan Castle, the magnificent ancestral home of the Chiefs of Clan MacLeod. The north west of Skye has two further peninsulas: Duirinish and Waternish. Waternish lies north east of Dunvegan and is the central of Skye's three north western peninsulas, and amply repays exploration. The village of Stein is especially pretty, while the ruin of Trumpan Church, near the far end of the peninsula, is the site of one of the worst atrocities committed during centuries of Clan warfare. The Duirinish peninsula, to the west of Dunvegan, is home to the Colbost Croft Museum. The area used to have two further museums, the Borreraig Park Museum, and the Glendale Toy Museum, but both have permenantly closed . South of Dunvegan, a series of side roads give access to a scattering of small settlements such as Orbost, Roag, Harlosh and Ullinish. As you approach Bracadale, you pass the well preserved Dun Beag Broch. The island of Raasay lies to the east of Skye, between it and the Applecross peninsula on the mainland. 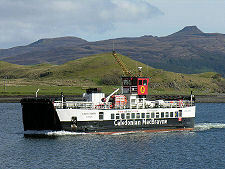 It is only a 25 minute journey by the Raasay Ferry from Sconser on Skye. The main settlement is at Inverarish, and the harbour is at Clachan, close to Raasay House and beside the ferry terminus at Churchton Bay. Also near Raasay House are the ruins of St Maol-luag's Chapel and the Raasay Pictish Stone. At the north end of Raasay is Calum's Road, an inspirational 1¾ mile stretch of road build by an individual crofter between the mid 1960s and the mid 1970s. Crossing the Skye Bridge to the mainland brings you to Kyle of Lochalsh. 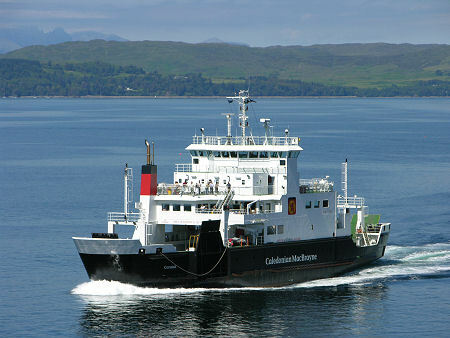 Until 1995 the crossing involved the ferry service operating between Kyle and Kyleakin. Since then most visitors to Skye have used the Skye Bridge, which since 21 December 2004 has been toll-free. Kyle is also an important rail terminal with regular services to and from Edinburgh, Glasgow and Inverness. The route from Inverness via Achnasheen and Lochcarron is one of the most scenic in Scotland. A busy port, Kyle is the hub of the local fishing industry and boasts a newly built lifeboat station. Pleasure craft also operate out of the harbour offering fishing trips, wildlife cruises or simply a chance to marvel at the magnificent Cuillin ridge on Skye. Kyle railway station is home to the excellent Kyle Line Museum. East of Kyle, on the north shore of Loch Duich, is Eilean Donan Castle, which features on more Scottish calendars than just about any other building. 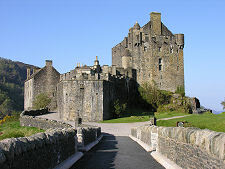 The original castle dates back to the 1200s, but was destroyed by the Royal Navy in 1719 after occupation by the Spanish (see our Historical Timeline). What you see today is a magnificent reconstruction largely dating back to a rebuild that took place between 1913 and 1932. Close by and just off the A87 is the village of Dornie, which is well worth visting in its own right. Further east still is Glen Shiel, home to some of the best ridge walks and many of the most attractive mountains in the Western Highlands. Two excellent mountain walks feature the South Glen Shiel Ridge, and the Sgurr nan Conbhairean Group. The glen is also the site of the Battle of Glen Shiel, the only land battle fought during the brief 1719 uprising. North of Kyle of Lochalsh is the picturesque village of Plockton, brought to public attention in the 1990s by the filming there of the popular television series Hamish Macbeth. Standing at the seaward end of Loch Carron, Plockton was a crofting hamlet until the start of the 1800s, when it was developed as a fishery. The tiny curved harbour with its whitewashed cottages and palm trees along the waterfront is extremely pretty and, though busy with tourists in the summer months, remains unspoiled. On the road from Plockton back to Kyle you pass through the pretty crofting township of Duirinish. North east of Plockton, at the narrowest point of Loch Carron, is Stromeferry, though this has been without a ferry since 1970. From the head of Loch Duich at Shiel Bridge a minor road travels over the 1,100ft Mam Ratagan Pass before arriving at the head of the Glenelg Peninsula in the village of Glenelg. Nearby a small seasonal vehicle ferry links Glenelg with Kylerhea on Skye, while to the south a single track road continues around the peninsula to the beautiful villages of Arnisdale and Corran. Just north of Glenelg are the ruins of Bernera Barracks, while a little to the south east of the village are Dun Telve Broch and Dun Troddan Broch, two of Scotland's best preserved brochs. Driving Tours: The south of the island and Lochalsh are included in our Fort William & Skye Driving Tour.